One of things I'd love to see in nail polish more often are blue polishes or any cool-toned polish with golden shimmer. Many people mentioned to me that Love & Beauty from Forever 21 has one like this. What I did not know was that Love & Beauty polishes are really repackaged LA Girl polishes. Madeline from Girl Germs thankfully let me know this. It would seem obvious since the bottles are the same, but it never crossed my mind! Many thanks tp Madeline! I picked this beauty on Cherry Culture when they had a sale along with some other purples,greens, and blues with gold shimmer! This was part of the Color Addict line. Idol is a dusty navy with golden shimmer. Mainstream nail polish companies China Glaze, OPI, Orly, Zoya, (I know you've done this with purples, but please do it with blues), and etc please do blue with gold shimmer, glitter, or glass fleck combos. You will make me a very happy camper! This is such a gorgeous combination. This polish is beautiful and unique, and is right up my alley! Thank you LA Girl! I agreed that mainstream polish companies should do something like this, this is gorgeous! Wow, this is really gorgeous! 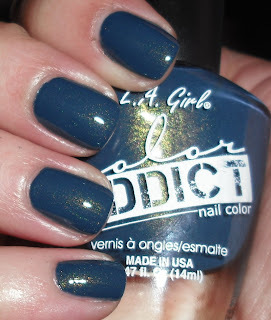 Love the blue with the gold shimmer-- I think I might need to have this! Ooooh! I want this color. This is gorgeous - I love the teal and then you throw in gold shimmer....perefect!!! sooooo gorgeous. I'm ordering from cherry culture today, this is definitely going on my list. Yay! I'm glad you got this one because it is awesome! Have you tried any of the other ones from the Color Addict line? All of mine are the Love & Beauty version but there's a dark grey with gold shimmer! Blue + gold = awesome. I would love to see true blues paired with strong contrast gold shimmer too!